Mish's Global Economic Trend Analysis: Fed Sponsored Poker Party Morphs Into "Old Maid"
Fed Sponsored Poker Party Morphs Into "Old Maid"
All weekend long I monitored the ongoing high stakes poker game sponsored by the Fed, the Treasury, and the SEC. Progress of the game appears below for historical reference. A quick summary will follow. High Stakes Poker Update: Barclays Refuses To Go "All In"
Fed, the Treasury, and the SEC were acting as the dealers (or carnival barkers if you prefer). Merrill Lynch (MER), J.P. Morgan Chase (JPM), Goldman Sachs (GS), Citigroup (C), Bank of America (BAC), Barclays, and others were all players at the table. Lehman (LEH) was not a player. Lehman was the pot. The role of the carnival barker was to get the amount bet as high as possible. Dealers hoped to goad Barclays and/or the Bank of America to go "all in". Both refused. Numerous side games developed and a deal was struck between Merrill Lynch and Bank of America. Another side game is still in play with AIG begging the Fed for cash. At midnight, in the Cinderella Pumpkin Room, the game morphed into The Old Maid. 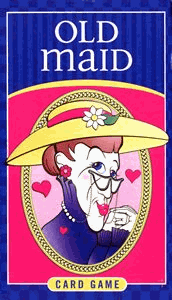 Inquiring minds just might be asking "Who is kissing the old maid?" It's a good question too. The answer can be found in Pimco, Vanguard Are Biggest Bond Fund Losers in Lehman Collapse. Pimco holds Lehman bonds in at least 12 of its funds, including the $134 billion Total Return Fund. Bill Gross, manager of the fund and co-chief investment officer of Pimco, was buying Lehman bonds as recently as June, Bloomberg data show. John Woerth, head of public relations at Vanguard, said the company holds Lehman bonds among the $450 billion of fixed income it manages. Axa SA, Europe's second-biggest insurer, and unnamed affiliates, own 7.25 percent of Lehman's equity, according to the filing. Interestingly, the cards nearly everyone thought to be old maid cards (treasuries) are rallying strongly. I continue to expect new all-time lows in yield on the 10 year notes and long bond. Also of note today, the US dollar index and the Euro are both flat on the day. Inquiring minds may wish to read US Dollar Rally Not Over Yet for further commentary and charts. Professor Kevin Depew was on top of the call this morning with a very pertinent reminder in It Was Fun While It Lasted. The most important thing equities investors and traders should keep in mind here is that this debt destruction will be an ongoing process. It is tempting to see the Lehman (LEH) bankruptcy, the Bank of America (BAC) and Merrill (MER) deal, as signposts marking the culmination of a financial stress event They are not. They are merely symptoms of an ongoing debt crisis. By allowing Lehman to fail, the Fed has, perhaps inadvertently, embraced debt deflation and even contributed to it. The net result of the failure is more credit contraction and debt destruction. Some will argue that by adding $25 billion to the now $200 billion Treasury lending facility, accepting equities as collateral and by cutting short term interest rates, which the FOMC will almost certainly do tomorrow, the Fed is making more credit available, but that credit is being absorbed by the financial system so quickly that the net result is a still continuing credit contraction. Inquiring minds will want to take a look at Kevin's article. It's an interesting read comparing jellyfish to financials. The key point, and one I have been harping on for quite some time, is that credit is being destroyed far faster than the Fed is monetizing. This is deflation, and it is happening right here right now. There is no other logical way of looking at it. Those playing Old Maid, betting that debt could or would perpetually be bailed out by the Fed and that treasuries would sink as a consequence, made the wrong bet. They are now kissing the Old Maid.